The Newport VPH-2 vertical post holder is only 2" tall, making a very compact choice for mounting components. It accepts standard 0.5" posts. The bottom has a hole in which a 1/4-20 screw can be mounted through to hold it onto breadboards or Optical Tables. Black Anodized Aluminum. 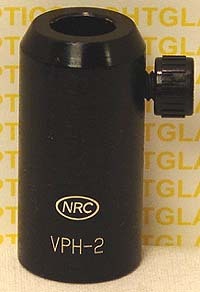 Newport VPH-6 Vertical Post Holder- 6"